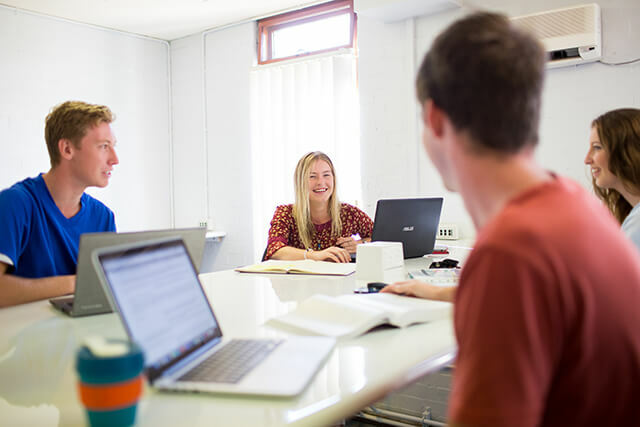 Our abundant communal spaces bring people together, yet provide quiet space for study and time out. We have a laptop bar and a newly renovated Junior Common Room with couches and big screen TV. 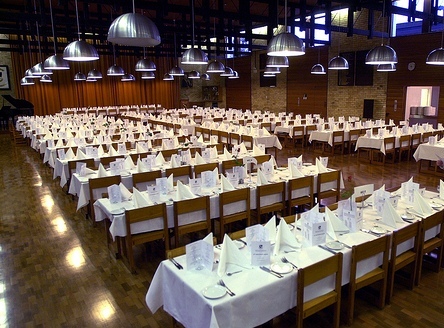 Our impressive Dining Hall, (or ‘D-Hall’), is the backbone of our college where we eat dinners together, and hold our formal dinners and functions. 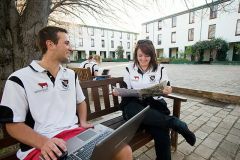 The open lawns and courtyards are a unique feature of Page, and provide the perfect spot for sporting and leisure activities. Plus there's plenty of near-by parking. Our BBQ area where people converge for outdoor catch-ups and make use of the hammocks and free BBQ facilities. Earle Page has a large, traditional dining hall that has been the centre of college life for 50 years, providing a venue for events, everyday conversation, and group study. 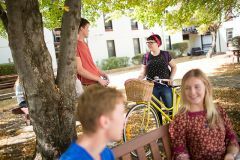 Communal dinners are a large part of the college experience, and at Earle Page floor groups traditionally dine together creating a friendly family environment, enhancing your dining experience and connection to your fellow collegians. Past residents quote our Dining Hall as a ‘unique space to Page’ that enables the 54 years of tradition, namely formal dinners, to live on in all of their glory, and for us to meet of an evening to share a meal and talk about the day. Our family oriented college means you will always have someone to eat with. 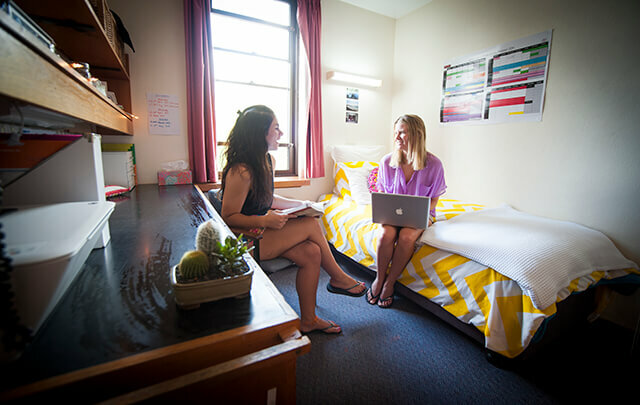 Your college room is more than just a place to sleep. This is your space, somewhere to escape to but also to hang out with your mates. It includes a heater, desk, chair, bed, lamp and wardrobe. You will need to bring along your doona, sheets, pillow and photos to make it your home away from home. Posturepedic king single or regular single mattress. We recommend king single sheets to accommodate the larger bed. 1 Bathroom on each floor each consisting of 5 showers and toilets. Whether you’re a gardener from way back, studying sustainability or just like the idea of playing in the dirt with new and old friends, this might just become your new ‘zen zone’. EPC's Community Garden is the first of its kind on campus, and is still in the creation stages which is exciting for our residents. Our Sustainability Officer is looking to make this a creative and vibrant space for our community in the coming year so watch this space! We’re talking composting, worm farming, vege gardens and hopefully some Page produced artwork…bring your ideas and passion to this new and exciting project. 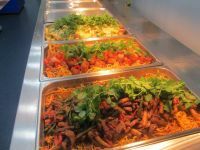 Earle Page has options for both catered or self-catered accommodation. If you choose a catered contract, your meal package offers five dinner meals Sunday-Thursday in the historic college Dining Hall. 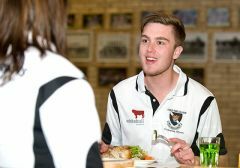 Floor groups traditionally dine together creating a friendly family environment, enhancing your dining experience and connection to your fellow collegians. For self-catered residents, you will have access to a communal kitchen to prepare your meals, with the option of purchasing meals from the dining hall as desired. Other meals can be purchased at Austin College Dining Hall - Walters Cafe (just next door).